It is not always a bad experience of having business trip to China, like the one I had in Nanjing. 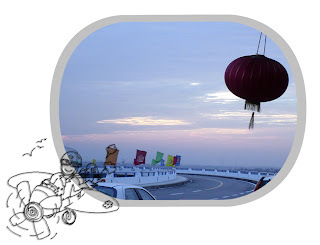 October 2005, I had to go to Nanjing for a short business trip as usual, no big expectation. But when I arrived the airport, I met the first good sign; a local taxi driver who approached me and out of expectation, I agreed to take his car to my hotel. This was not my ordinary choice, because this kind of taxi would usually charge more than the usual fare and you would have a big trouble if the fee couldn't be settled while you were on your way or your luggage was still locked in his car's storage. May be it's because of his tone of promise, and the peaceful feeling that I felt. I arrived my hotel safely, the fee was fair charge as seen on the meter. So I agreed to take his cab again tomorrow when I left. Second good sign was an upgrade to my hotel room, the view was so nice that I almost thought I was in Tokyo rather than in China, a comfortable hotel with good breakfast was the best reward for my work other than cash. My job went smooth without big obstacles, and the only bad thing was I had to wake up at five, forgot my deluxe hotel breakfast, replaced by an instant noodle and met Mr. Chan under the cold weather of 4-5 degree, in order to depart at eight. At six, the street was still dark without much lighting, Mr. Chan had already waiting in front of my hotel, he turned on the heater a bit earlier so I could jump into the warm seat at once. We had a good travel time within that 45 mins., watching the sky turned from totally dark into a shimmer of silver.Not much communication, but the trust and relaxation was hardly found ever since in China. When we arrived, I gave him not only the reward he deserved but the sincerely thanks that was difficult to express. I went out from the cab, a cold chilled air hit onto my face, when Mr. Chan's taxi just vanishing, a touch of pink began to spread out from the silver blue sky, so beautiful......I wanted to light up the a cigarette, like those scene in the movies, but as a non-smoker,what I could do was, took a deep cold breath of air in and said : Good morning Nanjing. Beautiful story. Sounds like something from a movie, or a book. Actually, this experience could pass as the introduction of a novel. You could name the novel, as u've named your post, "Good Morning Nanjing." Thanks Patrice, I do have the same feeling too. To feel and to appreciate,then you will enjoy what design brings into your life. Share book reviews and ratings with Cocoa, and even join a book club on Goodreads. Cocoadesign.net Copyright 2009-2019. Powered by Blogger.